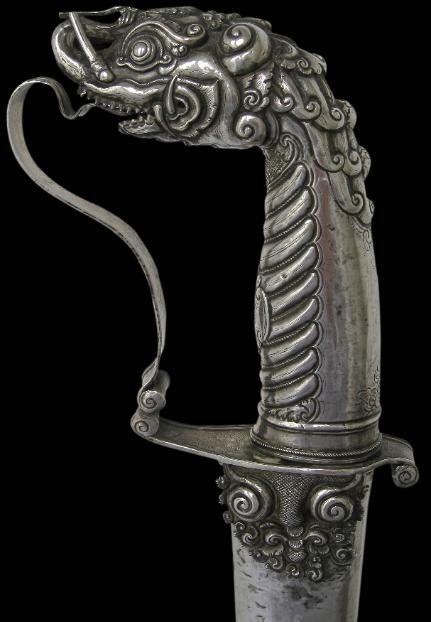 This straight bladed sword or pedang lurus represents an exquisite example of 18th-19th century Javanese silverwork. Also known as a pedang luwuk, the pedang lurus is associated with central Java, particularly Surakarta (Solo) and to a lesser extent Yogyakarta, each being royal centres with kratons (palaces) and flourishing court arts. makara, depicted almost in the cartoon-style of wayang characterisation. The pommel is particularly fine. The makara has an extravagant face with teeth, tusks, a curling snout, bulbous eyes and a curly main that falls over the back of his head. Apart from superb repousse work, it is engraved with localised Islamic flower motifs. Issuing from the mouth of the makara is a silver hand guard in the form of the creature’s tongue. This is finely engraved with floral motifs. The scabbard is in plain sheet silver over a wooden base, other than for a middle section of silver strips woven with copper strips imitating rattan basket work. pedang lurus in a form that is rarely encountered. Avieropoulou Choo, A., Silver: A Guide to the Collections, National Museum Singapore, 1984; Hardianti, E.S. & P. ter Keurs (eds. ), Indonesia: The Discovery of the Past, KIT Publishers for De Nieuwe Kerk, Amsterdam, 2005, pps. 101-4; National Museum Jakarta, Treasures of the National Museum Jakarta, 1997, Buku Antar Bangsa; and Van Zonneveld, A., Traditional Weapons of the Indonesian Archipelago, C. Zwartenkot Art Books, 2001.